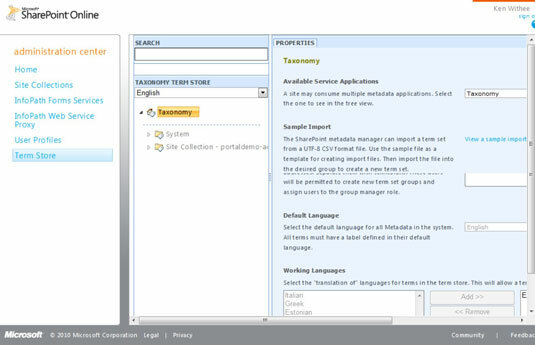 The Term Store for SharePoint Online is a global directory of common terms that might be used in your organization. The idea behind the Term Store is that you want to create consistency in the way data is entered and managed throughout your SharePoint environment. For example, you might have a Human Resources Department. You don’t want people to enter data, such as ‘HR’, ‘HR Dept.’, ‘Human Resources Dept.’, and ‘Human Resources Department’. These are all actually the same thing, but because people enter names in different ways, it becomes difficult to maintain consistency. Using the Term Store, you can enter the term as ‘Human Resources Department’ and know that every place throughout SharePoint that uses this field will enter it in a consistent way when referring to that specific department. The SharePoint Online Term Store page. In addition to the configuration information discussed in this section regarding Office 365, you also have full access to configuring the site collection within SharePoint.